I've been looking for a non disk brake solution for the bike for ages (no disk attachments on my lovely Raven carbon forks). Eventually I discovered this drum. I haven't attached the dynamo light yet and have only ridden it for 3 weeks (daily commute 16 miles, London, all weathers) but I'm pretty impressed. Once SJS had done the tricky bit of building it in to a new front wheel it's easy to install on the bike (bought the Sturmey brake level & cable too) I just had to do a home (jubilee clip) fix of the reaction arm on to the fork as the Sturmey clip supplied is too small for my fork diameter. Braking performance is very smooth and pretty powerful (compared with my previous high end Shimano parallel push rim brakes) and rain makes (obviously) no difference at all. It is noticeably smoother too I wish I'd thought of a front drum years ago, I feel so much safer being able to stop under full control in all conditions. (I'm 11stone, riding a Raven Rohloff , I'd think there's plenty of stopping power to spare for someone bigger). It's a bit heavy but at 80 quid for brake, hub & dynamo it's got to be a bargain. ProsStrong brake, good dynamo, maintenance free? I've built this into a 26" wheel with Rigida Grizzly rim. Only covered about 50 miles so far, half of that mileage in the dark, the dynamo powering a Schmidt Edelux lamp. I was very curious to see how strong the brake was if it was a bit weak I would have been disappointed. I needn't have worried, there is plently of stopping power there, it really is a very strong brake. The dynamo does a great job of powering the Edelux, I can discern no difference to my previous Shimano DH3N71 dynamo. It's a bit heavy, but I've been gradually constructing my dream commuting bike (with Nuvinci N360 transmission) and Thorn Raven frame, and minimising weight is not really a priority, I'm more interested in reliability and durability. This is a welcome addition to the bike, I'm sure we'll be very happy together. Excellent Product, And Great Value. ConsHeavier than a Bottle dynamo. ProsWeather Sealed and beautifully engineered. These taiwanese made Sturmey Archer hubs are far better than the later British made ones were, beautiful engineering, easily as good as the German hub dynamos. It's got minimal rolling resistance, frankly once on the bike you don't even notice it. The 90mm drum brake is massive and you could easily chuck yourself over the handlebars once it's bedded in. 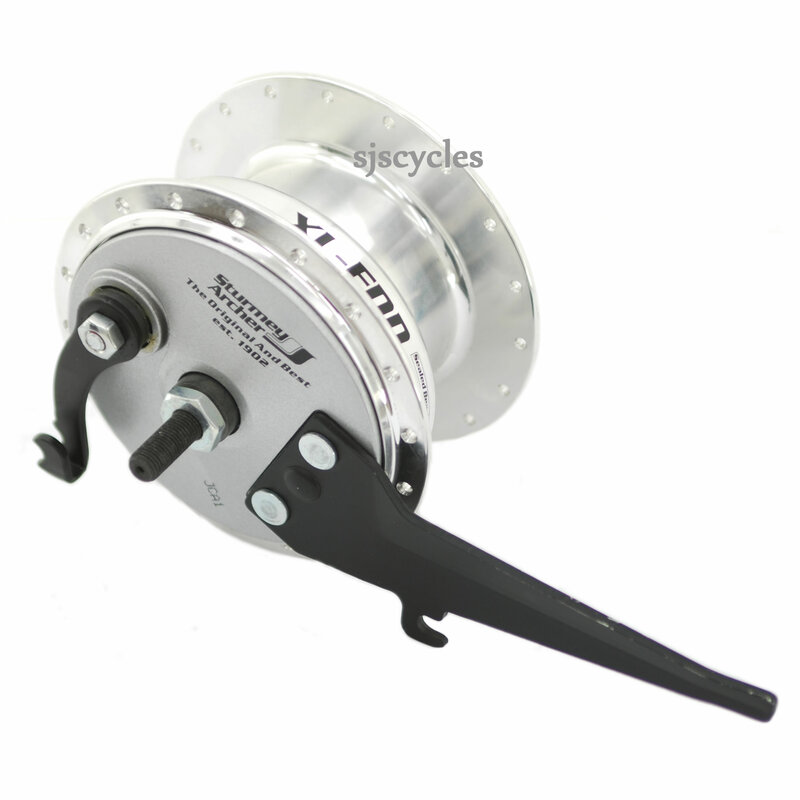 Can I order this hub in black? Unfortunately we only do this hub in silver. Cable brake and other accessories are not in the photos, like in other front hubs. Are they included? All of the fittings and cabling is supplied, there is no brake lever supplied though so you'll need to supply that yourself. Can These Drum Brakes Be Used With Sti Drop Bar Levers? I have shimano 8 speed STI levers and would like to run a front hub brake/Dynamo. Drum brakes use the same cable pull as calliper brakes so will work absolutely fine with your STI levers.